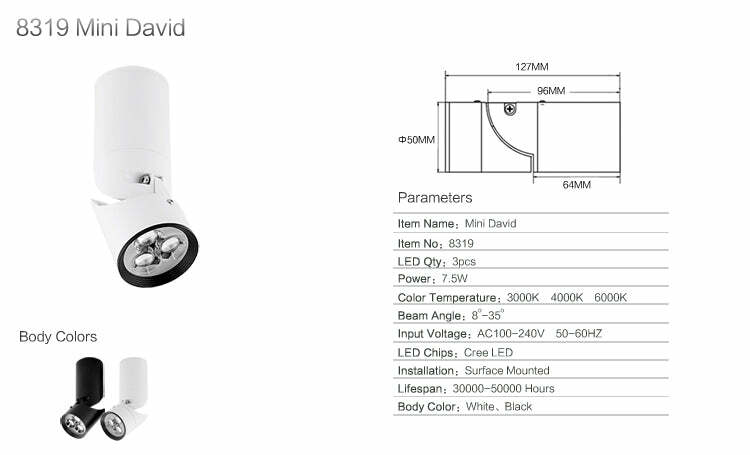 8319 Mini David LED Focus Spotlight The core technology of LEDing the life: the flexible focus control technology—Small David This luminaire is an integration of the focus control technology and stylish design. 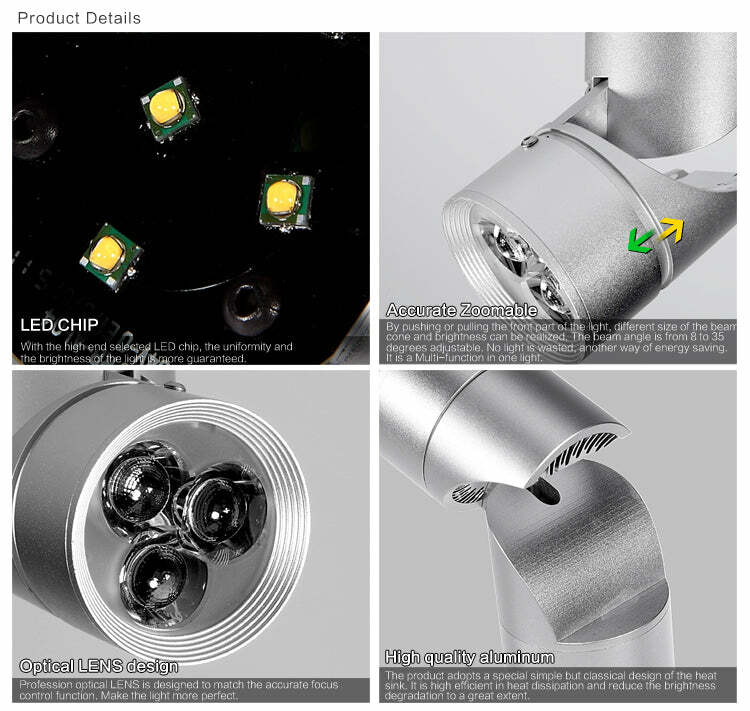 With a full range of 360 degree rotatable and a 90 degree vertically adjustable direction function, the product can be zoomable from 8°~35°, so a different size of beam cone and brightness can be achieved by stretching the front part of the light. when you need the silver body color for 8319,please leave a message in your order,thanks. By adjusting the focal length, the brightness and the illuminating scope is changed according to the illuminated objects. Wherever the object is, it can be always highlighted with the help of the 360 degree rotatable function! The 90 degree direction adjustable function also offers you more freedom for the lighting design. Warm white, neutral white, and cool white are available for choosing to make the lighting ambience you like. zoomable light distribution,Uniform light,improve the utilization rate of light. 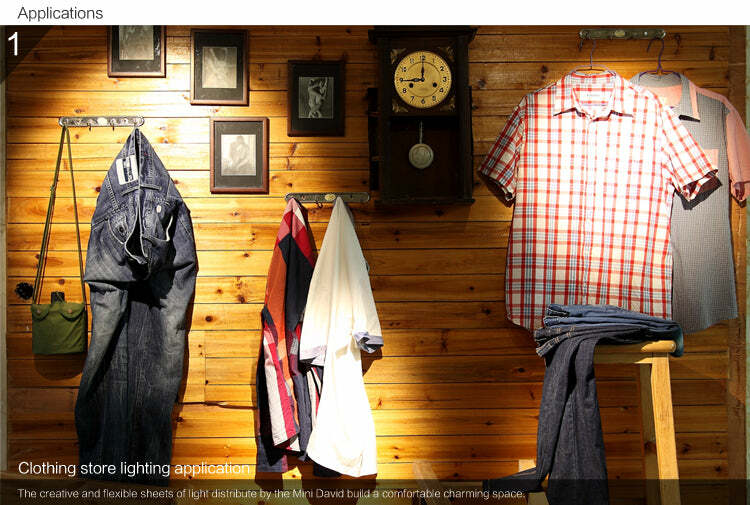 The creative and flexible sheets of light distributed by the Small David build a comfortable and charming space. The brightness and darkness weaves an artistic light effect into the area. This is achieved by the focus control function which makes the home more relaxing, don’t you agree? With the focusable light, you can create your own characteristic lighting effect according to the style of your furniture and setting. The common spot light beam is scattered. It is difficult to set off and highlight the settings perfectly. 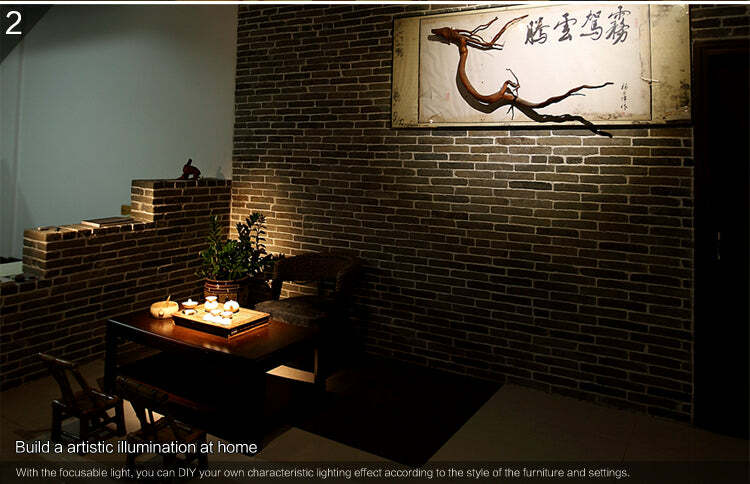 Using the focusable LED spotlight, you can build a comfortable, highly efficient, and mood shaping lighted environment. With the high end selected LED chip, the uniformity and the brightness of the light is more achievable. The special design of the heat sink is highly efficient in heat dissipation and reduces the brightness degradation. The high quality aluminum body of the light fixture is finely anodized. And the certified driver insures a longer lifespan for the luminaire. So we will arrange the light positon and brightness precisely. Where is the LED source from? How much light is just right?--is under your control. Especially good for creating a kind of romantic or cozy atmosphere you want,or highlighting a shinning stone.